The teapot is marked as a second which I believe is only due to the writing on the base not being totally square with the handle and spout. I can find no other imperfections or irregularities. ~~ Royal Doulton "Paradise" Fine Bone China Teapot ~~. |Very clean inside. Tiny loss of pattern on one side but that's about all. Rare to find a teapot in this pattern by Royal Doulton. 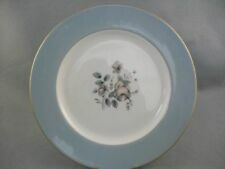 This is a lovely item produced by Royal Doulton of the Potteries, Stoke-On-Trent, Staffordshire, England. In very good condition, has age related crazing. Antique Royal Doulton Teapot, Jug and Plate Stands. Jug height - 15cm. Teapot height - 10cm. Model number D6966 issued 1994 in a special edition of 2500. Royal Doulton Bunnykins Teapot. 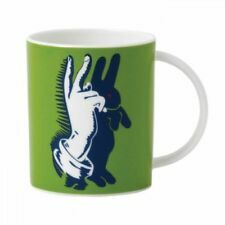 from the Bunnykins Teapots of the World Series. Brambly Hedge Miniature Teapot,Made by Royal Doulton and Made in England. Bone China. First Quality. One Large Teapot, Cake Plate Sugar, Milk Jug and Two cup,saucer and tea plate - Trios. IN THE VERY ELEGANT CASCADE PATTERN. Royal Doulton Clarendon 2 pint Teapot. Here is a teapot in the classic Carnation pattern from Royal Doulton. It's 1st condition. It's had very light use, if any. A super 22 piece Royal Doulton “Berkshire” fine China tea set comprising: 1 x teapot 7 inches high to finial x 8 1/2 inches spout to handle 1 x milk jug 5 inches spout to handle x 3 1/8 inches high 1 x Sugar bowl 4 1/2 inches in diameter x 2 3/4 inches high 1 x cake/sandwich plate 10 1/2 inches handle to handle 6 x cups 3 3/8 inches in diameter at rim x 3 inches high 6 x 6 inch saucers 6 x 6 1/2 inch plates All measurements are approximate. Apart from a small piece of missing gilt to one of the rims of the tea plates And some very minor knife marks to the centre of the cake plate,they are all in very good used condition with no chips, cracks or craquelure. ROYAL DOULTON BRAMBLY HEDGE MINIATURE TEAPOT 1st QUALITY. IT'S A GREAT ITEM THAT WILL ENHANCE ANY GOOD BRAMBLY HEDGE COLLECTION. FULLY MARKED ON THE BASE IT IS FIRST QUALITY. Royal Doulton 'Atlanta' Teapot - Pattern H5237. Large white bone china 2 pint footed teapot - in great 'looks unused' condition. INTERNALLY IT IS TOTALLY CLEAN AND HOLDS 2.25 PINTS UP TO THE TOP RIM. IT IS IN EXCELLENT CONDITION AND LOOKS AS THOUGH IT HAS BEEN VERY RARELY USED IF AT ALL. THE SILVERED OR PLATINUM EDGING IS ALL PERFECT. A ROYAL DOULTON DIANA TEAPOT FROM THE ROMANCE COLLECTION no.H5079 MEASURES APPROX 15.5cms TALL NOT INCLUDING LID AND 22.5 cms FROM HANDLE TO SPOUT. IN EXCELLENT CLEAN CONDITION. 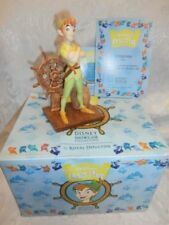 ROYAL DOULTON LIMITED EDITION CHARACTER TEAPOT. This is a great Two Faced Character Teapot that was issued as a Limited Edition in 2002. Royal Doulton only made seven different "Single Character" and eight "Double Character" Teapots, so if you do decide to collect them all it is not a never ending task. Royal Doulton Etude H5003 teapot. Beautiful china, embossed leaf type pattern, could have been made by world famous manufacturers here in Stoke-on-Trent. In good condition - a slight bump on the lid but doesn’t detract from this lovely piece. Tea anyone ?. You need the proper pot and this cheery Royal Doulton "Autumn's Glory" fits the bill. Made in England, # LS1086 No evidence of ever being used. Dishwasher, Freezer, Oven & Microwave Safe. A perfect 2 pint Royal Doulton 'Fairfax' Teapot. No damage in clean condition. A large tea pot in the Pastorale pattern by Royal Doulton, all pieces in vgc. IT'S A GREAT ITEM THAT WILL ENHANCE ANY GOOD BRAMBLY HEDGE COLLECTION. FULLY MARKED ON THE BASE IT IS FIRST QUALITY. WITH THE LID ON IT IS APPROX 6 1/2" HIGH. Doulton Ladies and Character pieces. 2002 Pirate and Captain D7182 243/1500. Winnie the Pooh. Brambly Hedge. May split if there is enough interest. This is a beautiful small teapot in the Royal Doulton Esprit design in fine English bone china. Royal Doulton Cadenza Pattern H5046, thus pattern was produced between 1977 until 1984 and is now discontinued. 1st Quality. 1 Rectangular Teapot ( RARE ). 1 Rectangular Milk / Cream jug. 27 Piece Tea Set. Coalport Ming Rose Miniature Tea Set - Made In England - 1st Quality. Coalport Ming Rose Miniature Tea Set - Made In England. 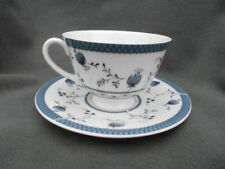 All the pieces are marked Coalport, Bone China, Made in England, Est 1750, Ming Rose”. Beautiful china, STRAWBERRY CREAM pattern, made locally by world famous manufacturers here in Stoke-on-Trent. Decorated with a deep black border interspersed with small pink flowers. Gilt trim. Elegant and sophisticated design. 22cm tip of spout to handle. Australia and Japan from £85. Ref 110 - 4. 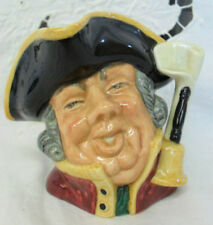 Royal Doulton Policeman And Felon tea Pot Rare 115/1500 D7174.. Tea pot as seen immaculate. Royal Doulton. Tea Service. Large Tea Pot. Completed by a Gilt Trim. the occasional light usage mark. Once Treasured; Now ready to be Treasured Again! intact with minimal gilt rub and only. Pattern and Glaze remain vibrant and.